The SPEAr1340 device is chip system-on-affiliation SPEAr® (Structured Processor Enhanced Architecture) family of embedded microprocessors. The product is suitable for consumer and professional applications, where advanced human-machine interface (HMI) in combination with high performance required, for example, low-cost tablets, thin clients, media phones, and industrial / printer smart panels. The device is a hardware-compatible support for both real-time (RTOS) and a high level (HLOS) operating systems such as Android, Linux and Windows Embedded Compact 7. 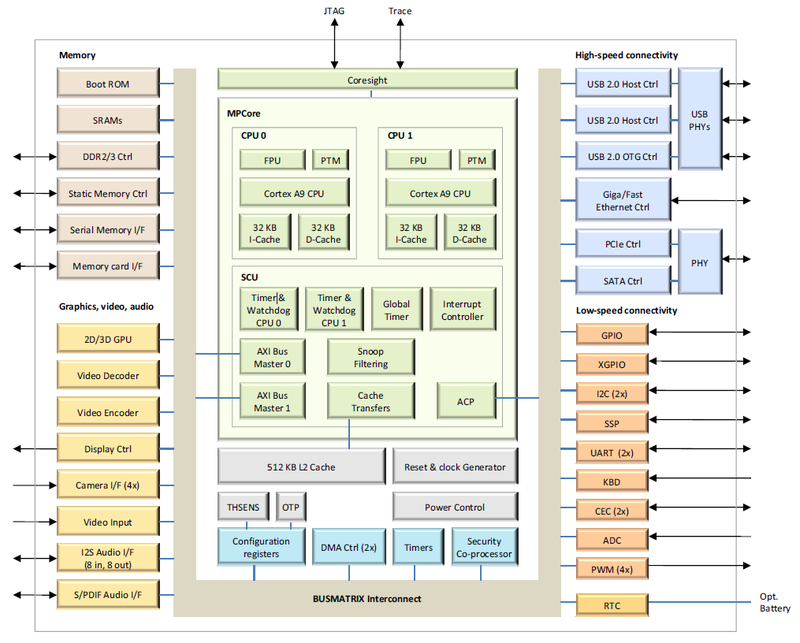 SPEAr1340 architecture is based on several internal components, communicating through a matrix of multi-layer interconnection (BUSMATRIX). This structure allows switching to different data streams to be simultaneously performed, improving the overall efficiency of the platform. In particular, high agents directly connected to the master controller memory DDR, to reduce access delay. The total capacity of the memory allocated to each of the master port can be programmed and optimized by an internal Weighted Round-Robin (WRR) arbitration scheme.